Over the past year or so, I have been trying to get some formal training on areas that may not be directly related to work I do; but have been personally interested in. Listing below the two certifications that I managed to complete during this while, and ones that I thoroughly enjoyed going through. Since both these employed self-paced, distance learning method, it was convenient to do these from the comfort of my home. If you are interested in these areas, I would definitely recommend these. 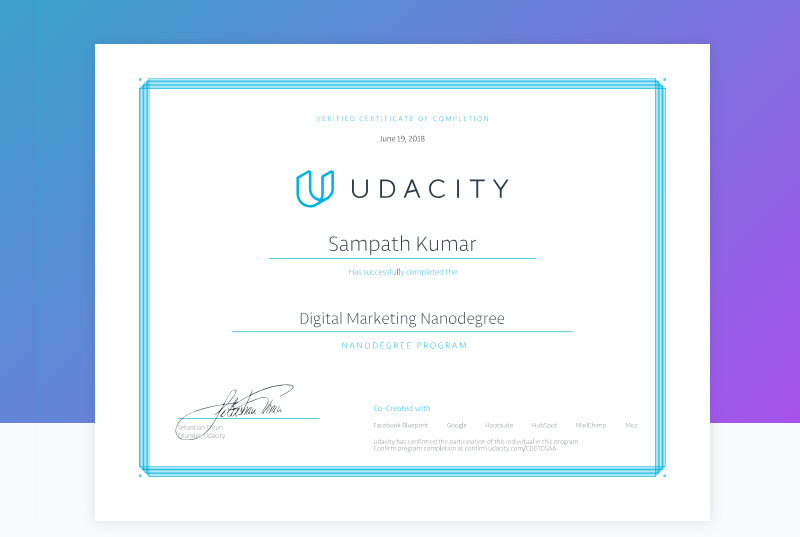 So now I am a Udacity-certified Digital Marketing specialist! Well, this was a fun course that took me right back to the days when I used to attend classroom sessions – complete with classmates, instructors, tests and marks! The magnificence of the new connected world! The course was a lot more harder than I expected it to be – with a deadline for completion, about 10 hands-on projects where I spent real dollars to market some real stuff and strict reviews by instructors. It also took a lot more time and commitment than I expected it to (my bad here. They clearly specify the expectations upfront; I just over-estimated my skills in the area and thought it would be a breeze for me). But I thoroughly enjoyed the video-based lessons by some very pleasant instructors and competing with classmates on getting better marketing results. This was another tough one that spanned almost a year. With about 6 exams to complete and a few writing projects, this course gave great insights into the art of creative writing. What I did not like about the program was its exam structure – where one had to memorise material from the books to pass. But otherwise, it was fun. The next one I am looking at is a language course. Let’s see how that goes.